"You have to focus on the bigger picture and learn the lessons when they go wrong and apply those lessons when developing future projects"
A senior figure in global infrastructure has said cost overruns are inevitable in big projects like the National Children's Hospital but that it is important to press ahead and learn lessons. Brad Watson, EY's Global Head of Infrastrucutre, is here for an International Project Finance Association conference where, among other things, the wider National Development Plan will be discussed. "Infrastructure is hard. They're complicated projects and tough to coalesce around. The challenge is you have to look out generationally, 10 to 15 year or 20 years. You have to commit to make the spend and to stay true to it to see the benefits," he said. 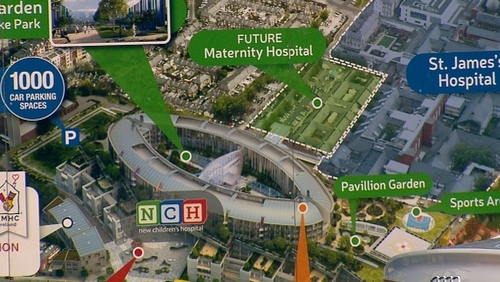 In relation to projected cost overruns on the National Children's Hospital Project, Brad Watson said there are other examples internationally. "The reality is that these are big complicated projects that are expensive, tough to plan and to design. Many things can happen. If you look around the world, you'd see other examples like that. "You have to focus on the bigger picture and learn the lessons when they go wrong and apply those lessons when developing future projects," he stated. In relation to the wider National Development Plan, Brad Watson said it was a good start to investing in future economic growth. "The fact that you have a plan is a victory. The plan demonstrates the importance of infrastructure and the benefits that come along with economic development and how infrastructure is an enabling factor in driving future economic growth," he said. Speaking of his own experience in the Middle East, he said an important driver of progress at a national level was making decisions and sticking to them.